I can look back at a lot of my experiences at BU over the past 5 years and talk about how they have influenced my life and who I am today, but none have changed me for the better like workingin the Bishop’s Arches Brewery has. Back on that fateful day last May when Dale Wood announced to our History & Science of Brewing class that he was opening up a brewery on campus, I decided I had to be part of that team. I approached him after class, point blank, and asked if I could participate. To my pleasant surprise, he said yes. Between Dale’s September back surgery and waiting for our federal permit, we got off to a late start in January. 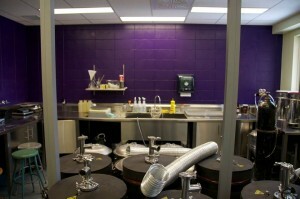 By the time second semester rolled around, we were so anxious to be starting in the brewery. We spent the first two weeks assembling all of our equipment, the BrewEasy, 2 Braumeisters and 14 fermenter units. This was a tedious and time consuming task, but we learned a lot about our equipment through the process of putting it together (I also learned a whole lot about tools, but that’s a different story). Assembly took about 2 weeks, as we received different shipments of our gear. By the third week, we were ready to learn how to use all of our equipment and start making beer. Of course, with this being an experiential learning class, the best way to learn was through trial and error! The first brew we made was a stout, and it was actually quite good (scratch that- it was awesome). By the end of that first day, we were all in love with what we were doing, and I saw that I had made the best possible choice in joining this team. It was surprisingly rewarding to see all of the chemical reactions we’d spent the past few years learning about in class play out in front of us to make something so great. As the weeks went by, we no longer needed Dale’s direct supervision in order to make our beer (though he rarely left our side due to his love and passion for both beer and for passing on his skill set on to his eager new protégées). We became more confident and knowledgeable about what we were doing, and more adventurous with our choice of ingredients. We stopped finding recipes to copy online, and began coming up with our own. Being such a small class of only 6 people, we quickly bonded and started calling ourselves the “Original 6” (since Dale is such a huge hockey fan). We decked ourselves out in matching workman overalls, and then coined a new nickname, the “ BU Brew Crew”. What started off as just another class (albeit the coolest class BU has offered to date) quickly became the focal point of our semester, with everything revolving around the brewery and our beloved Brew Crew. Our required time commitment in the brewery was 90 hours over the course of the semester, but by the end of February we had already surpassed that number. It became almost difficult to force ourselves to delegate our time to our other classes, because we just never wanted to leave. Over the course of the semester, I learned many things in the brewery. I learned that Dale and the 5 guys I had the pleasure of working with are the best lab team that anyone could ask for. I learned how to take the brewing process from start to finish (including kegging and tapping said keg). I learned how to lead a team through a day’s work in the brewery (by taking turns playing “brewmaster” every brew day), and how important proper sanitation techniques are in the preparation of beer. In a very hands-on environment, I got to apply my last 5 years of scientific knowledge to something I quickly became very passionate about, and the end result was fantastic. Spending the semester working in our Bishop’s Arches Brewery introduced me to a new field of work I had never considered before, and one that I am very actively pursuing now. 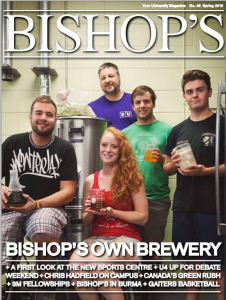 I can safely say that joining the Brew Crew and taking Dale’s History & Science of Brewing and Experiential Learning in Brewing Chemistry courses are the best decisions I ever made during my time here at Bishop’s. I strongly encourage anyone else who is interested to do the same, as it has truly been a life-changing experience. If you want to see what it’s all about, just trek on up to the chemistry floor in Johnson and have Dale or Karl show you around. I guarantee you will not be disappointed! On Homecoming Saturday, October 3rd, from 12:00 to 8:00 pm, the Bishop’s Arches Brewery is hosting the 1st annual Bishop’s Beer Garden. The Golden Lion, la Siboire, le Trou du Diable, and our own Bishop’s Arches will be present, showcasing great craft beer. 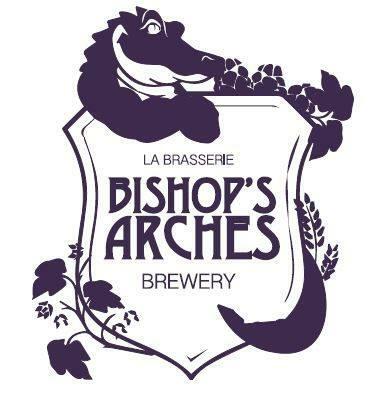 Beginning Monday, October 5th, Bishop’s Arches Brewery beer will be available for purchase from the brewery itself. For $15, you can buy a 64 oz. (4 pints) amber growler, embossed with the Bishop’s Arches Brewery logo, which you can have filled for $10. Regular e-mails will go out to let you know what’s on tap!